Ever since I got this cook book I look for excuses to bake a cake and the invitation from What’s for Lunch Honey combined with the fact that we were meeting Shawn & Stephanie made for the perfect storm. Why Shawn & Steph? After John & I eat a piece we give the rest to them – they’re young bucks and can use up the extra calories way better than we can! Then there was the cake part – the main part. 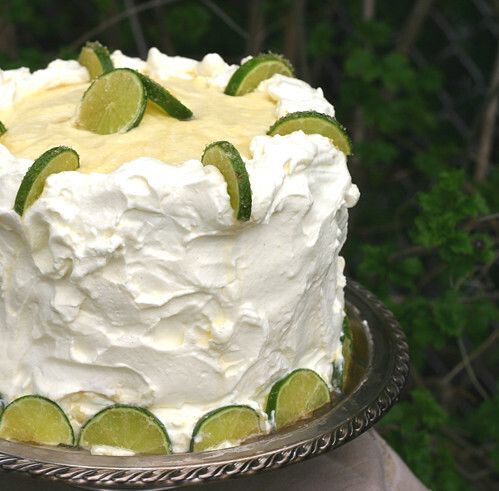 I had to make a new cake because the original was so unworthy of the filling and frosting – the original one was sitting on the counter (I had a hard time throwing out something that’s been soaked in rum) John tried it, spit it out and said “this thing tastes AWEFUL” . He NEVER complains when he’s fed – NEVER! Unfortunatly he was right. Ever had a recipe that you know just isn’t right, but you want to believe, need to believe – this was one of those. The second cake I put with it belonged to the Tiramisu Cake. 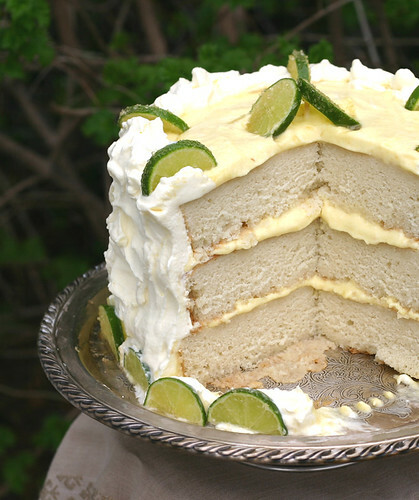 While this is a great cake to soak up some rum, it was too heavy to handle the light airy fluffiness of the Mango Mousse and Ginger Lime Cream. They would be better matched to an angel food cake. *UPDATE* April 2017 Made this again. The cake portion was one recipe of the Baptism Cake ,no rum soaking, it was truly divine! Set aside. *Note: if you are using this for a filling the author says to add 2 tsp of unflavored gelatin. Apparently the simmering breaks down an enzyme that would prevent the gelatin from working. Fold into Mango Puree. Refrigerate. Stir constantly until visibly thickened. About 3-5 minutes. Strain through a sieve to remove chunks. Fold into ginger-lime curd. Refrigerate. Serve Mango Mousse topped with Ginger-Lime Cream. How absolutely gorgeous! This is really the perfect party cake for my mingle. Thanks for bringing this along. Thanks for noticing – I just fixed it. That is the most delicious looking cake ever. How kind of you to say – Thank You! What a stunning cake. It looks delicious. Such a refreshing and gorgeous cake! Mango, ginger, and lime…sounds like a cool, refreshing dessert for summer. Thanks for the post! I love mangoes! And I love browsing your site. Your delicious sweets make me happy! Thanks for such a great site!! And thank YOU for such a lovely compliment! What a lovely photo. The ginger lime cream sounds so intriguing. hey. I tried your perfect quiche and is was perfect in deed. i love all your cakes!! they’re superb looking and must taste veryyy good! Thank you Noreen, I’ll be posting a couple more in the next month!